Saganaka Momen is the traditional hand woven cotton textile from Saganaka, Kizugawa City, Kyoto Prefecture. The museum is operated in coordination with “Saganaka Cotton Association” which has been working on restoring and carrying on its tradition to the next generation. The museum features the history, tradition, and culture of Saganaka Momen. In Keihanna Commemorative Park, the cotton, which had been one of the famous products in Minamiyamashiro area, has been cultivated to recreate the climate and landscape. The museum features the history, climate and culture of Saganaka Cotton, the textile which had been produced in Saganaka area, Kizugawa city from the Meiji period to the second decade of the Showa period, in coordination with the Saganaka Cotton Association, which has been working on restoring and carrying on its tradition to the next generation. 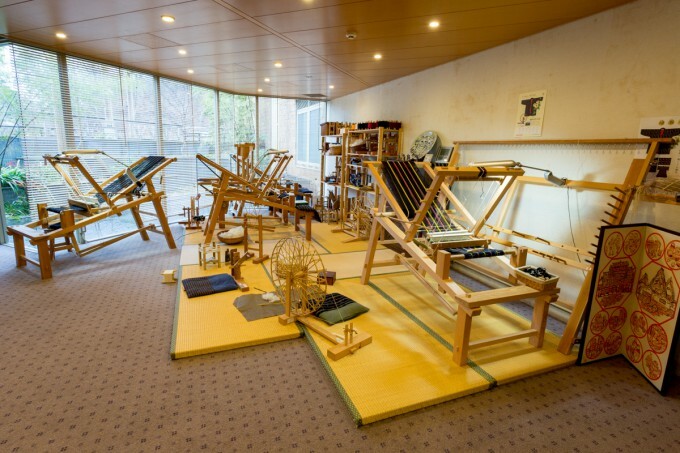 The whole process of making the Saganaka Momen is displayed, from the cotton cultivation, ginning, weaving, and the finished products as well as a gifts shop. Please feel free to visit the Saganaka Momen Traditional Museum. Open Hours: From 10 am to 5 pm *final entry for the hands-on workshop is 3 pm. Note: The hands-on workshops are available upon reservation. Please contact here.